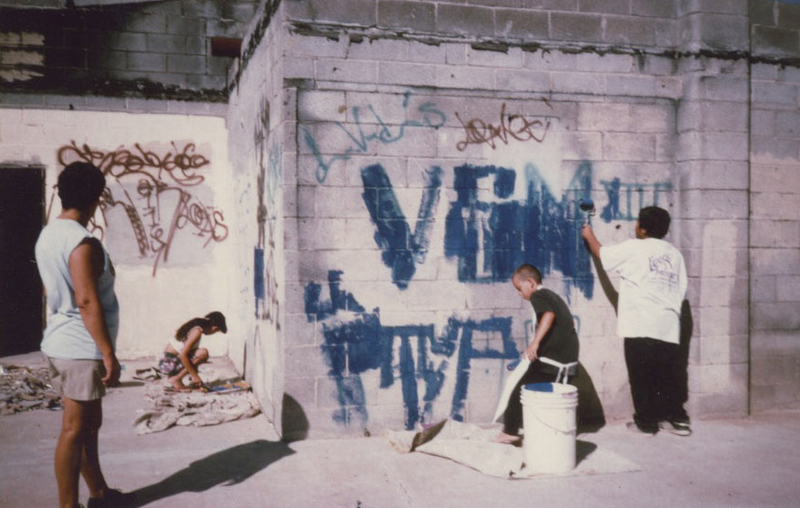 Mural Ordinance Archives: Position Issues | United Painters and Public Artists (UPPA), is an arts advocacy organization established by Artists to effectively represent and defend their interests. Vinyl production of facsimiles of “Cultural Heritage” and installation will require stringent supervision of a Certified Conservator-Restorer to insure the replacement of the “Cultural Heritage” (mural) is in accordance with the principles that embody the code of ethics, ethical standards and practice guidelines that govern conservation- restoration. These principles have been set forth in observance of all pertinent national, American Institute of Conservation (AIC) and Europe, European Confederation of Conservator-Restorers’ Organization (ECCO) laws. Since it is entrusted to the care of the Conservator-Restorer by society, s/he has a responsibility not only to the cultural heritage itself, but also to the owner or legal guardian of the originator or creator, the public, the future generations and to posterity. The Conservator-Restorer shall allow only products, materials and procedures which, according to the current level of knowledge, will not harm the cultural heritage, the environment or the people. Why Only Owners with Five or more Buildings on a Lot? The proposal to mandate that only property owners with five or more buildings on a lot is among the worst public policy proposals emanating from the Department of Planning in a number of years. Essentially, the department implies is that owners with only one unit, much less those not meeting this proposed threshold, are deemed as being of a lower class status. The department, to date, has failed to offer a public rational for this discriminatory and regressive proposal. For instance, what role does the number of buildings have on the quality of public art? Will public artists be forced to reject any and all contracts to perform public art on properties with less than five buildings? What values is the department imply with this class segregation policy? In clearly delineating the requirement for a minimum of five buildings per property, the department is overtly creating class based segregation in public art. In my view this is blatantly illegal. Conversely, artists at this point in the debate over the mural ordinance cannot mandate that the City Planning Dept. delete this devious provision. It was initially a part of the ordinance. During the extensive public hearing process, when representatives of the department could not offer a legitimate rational for this regressive public policy it was deleted. The ‘Final Draft Mural Ordinance’ did not contain any text and/or language on this issue. The ‘Second Final Draft Mural Ordinance’ clearly advocates a class bias be a provision in the Draft Mural Ordinance. We demand a full and extensive written analysis legitimating this provision and an explanation for it purpose in this draft ordinance. This provision will essentially decimate the linkage between public art and urban revitalization projects. A vast majority of working class homeowners have only one building on their respective property. Thus, it would be illegal for them to participate in urban revitalization and beautification projects based on this draft ordinance. If the community and city focused on alley, sidewalk, street frontage restoration linking public art and urban renovation, well over 90% of home owners in working class zones would be prohibited from participation. In fact, a vast majority of property owners in the city, irrespective of class (a fair estimate would be well over 90%) would be excluded from participation in any type of urban revitalization program the incorporates public art. The department has failed to provide the public with a rational in relation to how this provision will impact urban revitalization in the future and why it is essential to structurally limit participation by this section of the draft ordinance. Why does this draft ordinance directly discriminate against single family home owners? The rational, yet to be articulated by the city, appears pointless. Why are those property owners with only one house being unfairly targeted by this draft proposal? What public purpose is being exposed and endorsed by the city planning department on this matter? Is this the future of fundamental planning principles and ethics in the future, a class based litmus test? This provision will also clearly have a discriminatory impact on small rental owners with less than five buildings. In fact, a vast majority of rental owners in this city have only one of two multi-family structures on their respective properties. Thus, they will be eliminated from any benefit of public art and neighborhood revitalization. The City Planning Dept’s proposal will essential kill the “Green Alleys Project,” in South Central LA. This project, initiated by students and teachers at Jefferson HS, with strong community support was developed to restore alleys as a transit option for students who ride bikes to school and as an alternative to gangs. The students wanted to a space for themselves. They often use alleys to traverse to and from school. Needless to state, the alley’s are in horrible conditions, with all, and any types of urban blight. Faculty at CSU Los Angeles were initial supporters, and now UCLA and USC urban policy and landscape architects have collectively provided pro-bono support for this project. The goal is to clear, restore and finally beautify a network of alleys through public art. Virtually 99% of the properties are single family homes. Thus, this draft proposal would deny them the ability, along with students, teachers, community and public artists, the ability to paint fences and garages, poles and other objects in a manner that the students envision. This is a pathetic commentary of the state of the city planning department, to propose language that will destroy the dreams of youth and almost five years of intense planning to initiate the restoration of alleys for youth in South Central Los Angeles. The designation of Vintage Murals was a key demand, citywide, as a result of six months of public meetings on this issue. The key consideration of identification and protection of the cultural and historic legacy of public art in Los Angeles. This city, at one time, was considered the Mural Capital of the World. This was based on both the high quality of Vintage Murals, those public art productions that are nationally and internationally acknowledged and documented, and the significant level of public art that was developed between the late 1960s and into the early 21st century. The ‘Final Draft Mural Ordinance’, contained specific language defining and designation Vintage Murals as a critically important category. The major reasons were protection of cultural heritage, art tourism, the economy of public art, and long term copyright protection for public artists. The ‘Second Final Draft Mural Ordinance’ eliminated this designation. The City Planning Dept has failed to address this issue with a written analysis why this provision was deleted. In the current text, any type of public art, even graffiti art and/or murals being currently produced have the same status of the legacy public art that made this city internationally prominent. An irrationality in terms of this issue was an initial burst of discussion related to VERA and CAPA, federal and state laws relating to copyright protections and protection of public art. This was basically a waste of time. Those participants who constantly mentioned these interrelated laws should have known from the outset, that city ordinances cannot overrule either state nor federal law. This is simple logic related to our federal system of laws and governance. Thus those individuals constantly raising these laws, of no value to a city ordinance, are suspect in relation what purpose they were really engaged in during the public hearing process. The two most significant policies, that directly address the criteria, quality, specifications and professionalism necessary to protect public art, especially Vintage Murals, are the European Confederation of Conservator-Restorers Organizations (ECCO), and the American Institute for Conservation of Historic and Artistic Works (AIC). It is within the specific criteria established by ECCO and AIC, that credible debate over protection of artist’s copyrights, professional mural restoration and preservation techniques, and specific measures to insure qualitative protection of the legacy Vintage Murals throughout Los Angeles should have been focused upon to insure that the Draft Final Mural Ordinance presented before the Cultural Heritage Commission (the text supported by over 95% plus of public artists throughout the city) adheres to nationally and internationally recognized standards. The lack of specific language specifying Vintage Murals in the current proposed texts significantly and permanently diminishes the historic significance of public art in this city. Without any acknowledgment of key pioneering, prominent, and/or internationally celebrated public art, which is readily accessible in innumerable books on this subject, these treasures to the city’s cultural legacy will be lost. Without this type of designation, future grants from state, federal and/or foundation sources to preserve Vintage Murals will be negatively impacted. The proposed Mural Ordinance, is the only logical avenue in which the City has the opportunity to clearly identify, and essentially protect, prominent public art for the long term future. 2 Inhibits internationally recognized methods for conventional public art restoration techniques, which will result in the loss of designation of ‘original art’. The two most significant policies, that directly address the criteria, quality, specifications and professionalism necessary to protect public art, especially Vintage Murals, are the European Confederation of Conservator-Restorers Organizations (ECCO), and the American Institute for Conservation of Historic and Artistic Works (AIC). Both of these highly reputable entities have established specific criteria designed to insure, 1) protection of artist’s copyrights, 2) professional standards for mural restoration and preservation techniques, and 3) specific measures to insure qualitative protection of historically significant public art. The legacy of Vintage Murals throughout Los Angeles should be focused upon these two entities to insure that the Mural Ordinance adheres to nationally and internationally recognized standards. ECCO and AIC have developed internationally recognized mandates for the professional and technical standards to conduct art preservation and conservation. They contain strict guidelines to insure the integrity of artistic copyright and mural preservation adhere to recognized practices that do not impinge upon legacy art. These standards have been widely distributed throughout the world in relation to the ECCO and nationally by the AIC. One aspect of the debate over the Mural Ordinance is crystal clear, vinyl reproduction and/or computer generated vinyl art are not considered worthy of these standards. First, any type of reproduction eliminates any copyright protection. In addition, vinyl does not meet international standards for art conservation. Secondly, computer generated art is not considered equal to the artistic creativity involved in the production of a work of public art. Thus, any discourse on this specific matter should be oriented to specific consideration where the city will necessarily have to establish guidelines, the Dept. of Building and Safety, and the existing Sign Ordinance. In addition, we challenge any claim that there exists an ‘Eco-friendly’ gas and/or oil derived product. The City Council and Central City Planning Commission are surely knowledgeable that the city recently banned all plastic bags for environmental reasons. Returning to ECCO and AIC, the City Planning Dept, should at minimum be familiar with both highly influential public art preservation and conservation conventional requirements. The text in the future ordinance should reflect a serious orientation to adhering to national and international standards of mural protections, for both the artist(s) and the art work. It is within this framework that it is essential that the category of “Vintage Murals” be restored to the text of the Draft Ordinance language. Los Angeles should celebrate its public art legacy, as exemplified by Vintage Murals that have received national and/or international recognition. Thus, a Vintage Mural category will insure that ECCO and AIC technical standards remain a key goal in the preservation and conservation of public art for the long term future in this city. The lack of language specifying Vintage Murals will have a long term, detrimental impact on art tourism in the city. Vintage Murals are a reason why art aficionados plan trips to this region. They are the basis for tours, mainly by non-profit organizations, to attract members and new art supporters. For instance, when art tourist do on-line for public art in this city, and view the text of this proposed ordinance, no concept of Vintage Murals will appear. This would imply that a worst there is no significant public art worthy of a Vintage Mural designation or at best, the City does not really care about its public art cultural legacy. Collectively, the failure to recognize the significance of this designation, which was an ESSENTIAL COMPONENT of the initial ‘Final Draft Mural Ordinance’, is among the most glaring irrationalities of this proposed text. The failure to maintain a Vintage Mural section in the Second Draft, essentially and incredibly, elevates any public art, irrespective of quality, to the same status of Vintage Murals. Thus, even a high school student or a group of artists developing a public art project for the first time, have the same level of importance in terms of city public policy in relation to public art. This is irrational public policy. Clearly, the City Planning Dept has the basic resources to read a few nationally and internationally recognized books on this subject to recognize the importance of Vintage Murals to this city and the public art movement in the US. An important issue related to inclusion of Vintage Murals as a category in the ordinance is insuring that artist have the ability to defend copyright protections, and professionally manage future restoration and conservation activities of their prominent art work through ECCO and AIC. Vintage Mural status is a modest method in which the city should be fully supportive of its most prominent artists and historically significant works of public art. The final ordinance is the essential avenue for this level of appreciation, respect and acknowledgment of those artists who’s creative vision is nationally and internationally recognized. The city’s artistic community is experiencing a challenging period of survival. The imposition of fees constitutes a burdensome regulation that will have a negative impact on the future production of public art. In addition, it will have a regressive influence on younger public artists who want to develop a career in this field. The overwhelming public comments on this issue were negative. The City Planning Dept has failed to acknowledge the public comment record on this issue. The department, at minimum, has to offer a public rational in relation to the potential impacts on the future production of public art inherent in this section of the text in the proposed Second Draft. The City should no impose any fees on public art projects. The economy of public art is not substantial, thus any fee structure imposes an unfair and regressive burden on public artists. In fact, after almost an entire decade of banning public art (an incredibly incompetent level of public policy, especially in this city), any legislation should be designed to encourage, support and celebrate the renewal of public art throughout the city. Any type of fee structure contradicts the goals and objectives of the future adoption of a Mural Ordinance. 2 The motion picture and television industry have significant fees and taxes waived in relation to cultural production. Currently, the city has aggressive offer fee waivers and/or tax holidays for other related areas of creative production to encourage the economy of art and culture in this city. For instance, the motion picture and television industry have significant fees and taxes waived in relation to cultural production in this city. The city is willing to forego substantial levels of tax revenues to support the cultural production economy. Public art should be in the same category. Public artists deserve the same consideration as other sectors of the cultural economy in Los Angeles. The city should be completing supportive of the public art tourist economy in Los Angeles, especially the renewal of public art production in this area. 3 Disincentive for young, emerging artists to engage in public art. Forces public artists to eliminate inclusion of community youth in job training activities and/or apprenticeships due to fee considerations. An important legacy of the public art movement has been the inclusion of young, emerging artists within this arena of cultural productivity. In additional, public art is a pro-active socialization avenue that nurtures pro-active socialization. This is an alternative to regressive, destructive behavioral patterns, and thus city policy should be totally supportive of young emerging artists. A fee structure is a disincentive and a barrier to inclusion of the youth generation in positive arenas of career orientation and community revitalization. The ordinance should waive all fees for young emerging public artists. A mandated fee structure hinders the inclusion of youth in the future public art movement of the city. No city policy should regressively impact nor eliminate the ability of professionals toward the inclusion of community youth in job training activities and/or apprenticeships. 4 Public art being developed on a ‘pro-bono basis’, should not be required to pay a fee. The draft ordinance needs to incorporate specific language that eliminates any fees on Public art being developed on a ‘pro-bono basis’. The draft text should not penalize those public artists who are not being paid to produce public art. In addition, any public art project that includes job training, youth employment or is linked to an urban revitalization project should not be required to pay a fee. Imposing a fee should not be a detrimental barrier to enhancing the public art experience in this city. Nor should those artists, working in communities be forced to ‘pay a fee’ when offering their services on a, mainly, pro-bono service. The mural artists, art supporters and arts organizations of this city Publicly Demand that the City Planning Department respond, in written analysis, with their rational on the following four questions based on fair and ethically planning principles. 1 Why did the Planning Department fundamentally restructure the “Final Draft Ordinance,” between the hearings before the Cultural Affairs Commission and the Central City Planning Commission? 2 Why have the overwhelming majority of public artists and supporters perspectives been ignored by the Planning Department? 3 What value, if any, was the five month public meeting and opinion process to this Second Final Draft Mural Ordinance? 4 Why did the Planning Dept. not distribute the Second Draft Final Mural Ordinance for public review, since it contained numerous, structural changes not offered for public comment, in an adequate time frame prior to the meeting before the Planning Commission? On Tuesday, March 27, 2013, at 3pm, a meeting with Councilmember Mitchell Englander was arranged by executive director, Isabel Rojas-Williams of MCLA to discuss the 01.15.13 proposed Mural Ordinance. Attending with Englander was Deputy Phyllis Winger, 12th District Chief Planning and Land Use, Isabel Rojas-Williams, Mural Conservancy of Los Angeles and William F Herron, Director/Co-Founder of Conservancy of Urban Art. 1. If decorative art murals (not defined by content) on exterior walls of a single family unit or zone become illegal in all 15 Districts, the following and existing walls will have to be painted out erased or removed by property owner (@ owner’s expense), if property owner does not comply after a city citation is served (additional work for city employees) city graffiti abatement units will have to bear the extra work load @ tax payer’s expense. a. All existing fences, low walls, surrounding property line walls, alleyways, front court yards and entry’s, car ports, garage doors and retainer walls with decorative art murals, vines and community beautification graffiti deterrent images or designs. b. All walls with existing decorative art murals not grandfathered, vintage or in registered status. c. All existing walls with decorative art mural finishes including all faux finishes, all tile borders, stone and sculpted rock wall reliefs, wall fountains and wall garden décor, venetian wall plaster or stucco finishes, decorative wall ageing and all wall trompe l’oeil . 2. The annual budgets for the 15 districts will have to increase in order to implement the removal of a, b, c and the removal of graffiti and vandalism that will be provoked following the decorative art mural removals, in particular, walls with easy street access will attract additional unwanted vandal graffiti. In conclusion, in order to avoid increasing taxes and in the immediate future, saving millions in tax payer dollars, Mrs. Rojas-Williams and I recommended allowing decorative wall murals on a single family unit or zone, classifying existing decorative wall murals as Vintage (for Grandfathering status), and exempting them from a registration fee. Also, upon the effective date of the new mural ordinance, all new decorative wall murals will have to comply with the new regulations, registration, and fees.